Architectural details give way to a turn-of-the-century industrial home. Exterior gable end. 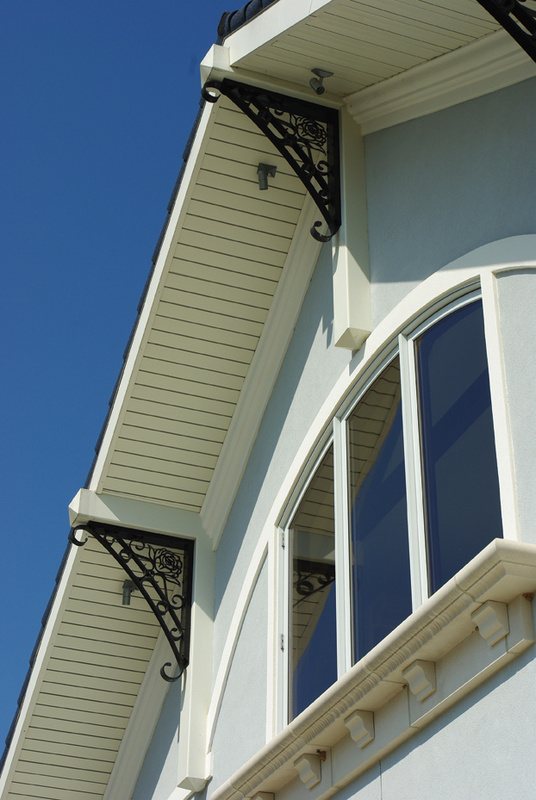 Ornamental stainless-steel gable end brackets support the oversized overhang of the roof. Ballroom. An expansive ballroom, measuring 40' wide and 55' long, is the focal point of the main level of the home. Exterior at rear. Looking up towards the tower from the rear of the home provides a dramatic view. Master bath grotto. The master bath is the ultimate place for relaxation. A 16' wide ocrtagonal grotto features a faux stone waterfall, five copper lion head fountains and a 4' tall skylight at the peak supported by a mahogany truss system. Rear foyer. Custom interior doors with mahogany stiles and rails with cherry panels lead the way to the garage. Milk glass rose carving. Abraham Mohler created the custom carving with innovative material and technique. Stairwell. The custom-crafted stairwell runs from the lower level to the third-floor tower. A 20,000-square-foot, turn-of-the-century industrial space would be any architect's dream project. For Jeannie Brendel, Brendel Architects, this dream home has been a collaborative project for more than 10 years. Now nearly complete, the architecturally savvy elements are shining. Working with builder Chris Pagano, Pagano Development, as well as countless talented craftsmen, the homeowner and Jeannie have created a turn-of-the-century industrial space sure to inspire. Detailed elements include ornamental ironwork custom designed by Eureka Forge. Here are some of the exceptional architectural features in the modern masterpiece. Exterior gable end. Ornamental stainless-steel gable end brackets support the oversized overhang of the roof. 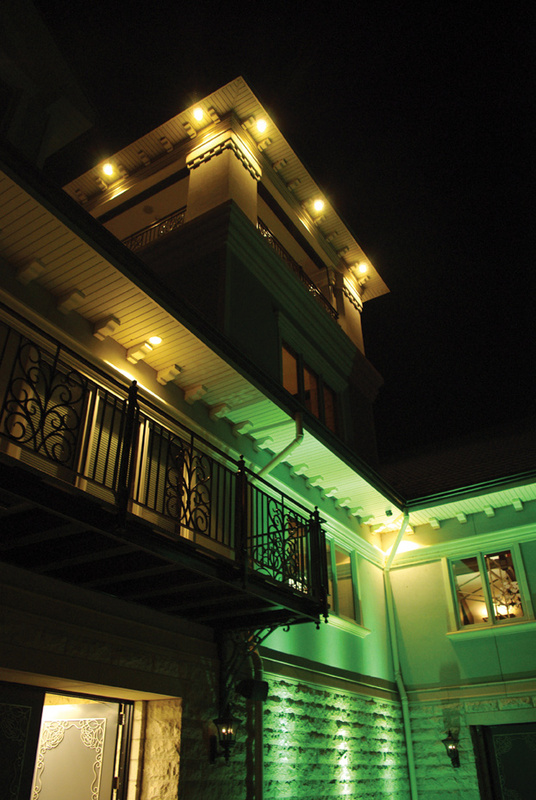 Stucco and Waukesha stone with Arcustone sill and corbels complement the exterior and frame the Loewen windows. Interior wood beams are mimicked in the decorative white stucco accents. Ballroom. 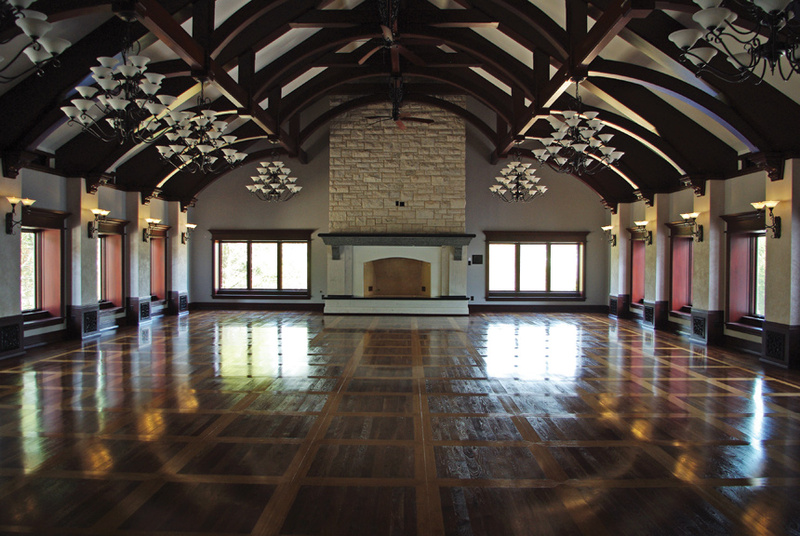 An expansive ballroom, measuring 40’ wide and 55’ long, is the focal point of the main level of the home. Arched mahogany trusses adorn the steel roof framing. Bamboo inlays accent the rich walnut wood floor. The ballroom’s column bases conceal speakers and are covered with ornamental ironwork in the form of a rose. At the far end of the room, a 12’ wide granite and stone fireplace features custom carved granite corbels. Exterior at rear. Looking up towards the tower from the rear of the home provides a dramatic view. The tower sits 24’ above the main-level floor and 36’ above the grade. Temperature- and moisture-activated radiant floor systems were installed to control snow. A dumb waiter runs from the lower level all the way up to the tower. An automatic screen system can close off the tower for all-weather use. Master bath grotto. The master bath is the ultimate place for relaxation. 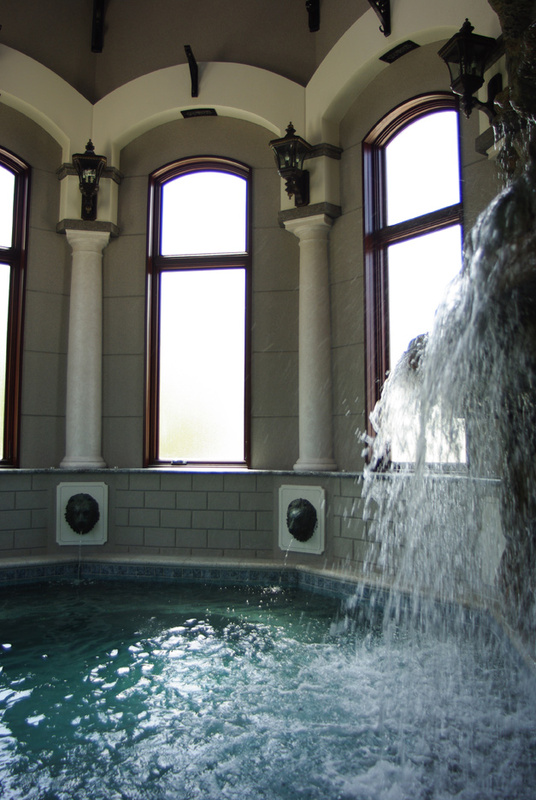 A 16’ wide octagonal grotto features a faux stone waterfall, five copper lion head fountains and a 4’ tall skylight at the peak supported by a mahogany truss system. The heated tub has adjustable water levels and contains jets on the sides and bubblers on the floor. Ductwork for the Desert Aire HVAC system is hidden in columns and arches above the windows. Supply air grills direct air flow across the windows to control condensation. Rear foyer. Custom interior doors with mahogany stiles and rails with cherry panels lead the way to the garage. 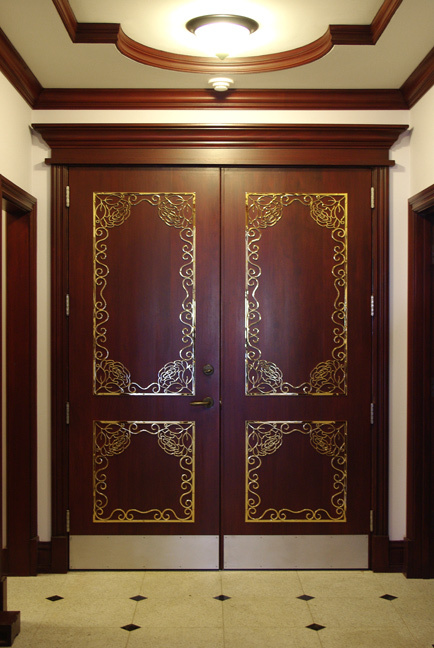 Stainless-steel appliqué with gold plating adorns the rear entry doors. The ceiling has a recessed tray with mahogany trim. Bethel white granite floor tiles with Labordorite green accents contrast the rich wood doors. 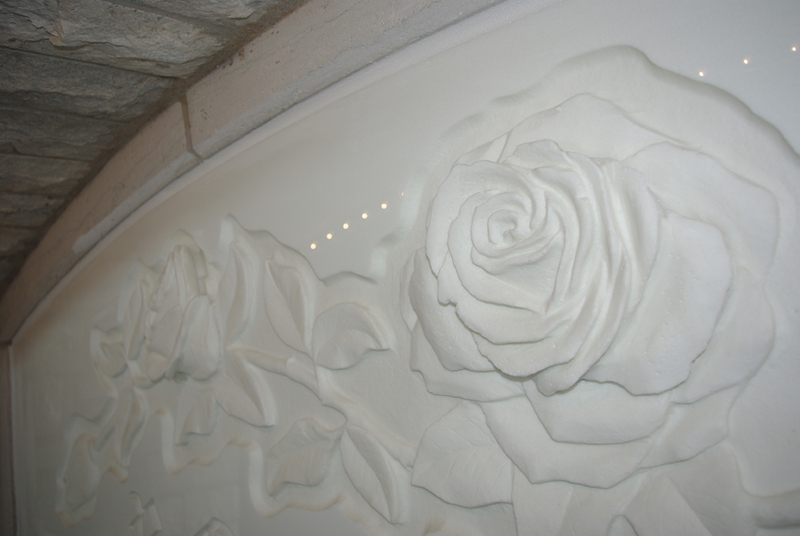 Milk glass rose carving. Abraham Mohler created the custom carving with innovative material and technique. Cut from 1 ¼” milk glass, the carving is sandblasted and sculpted with diamond abrasives. The glass piece is strategically placed at the rear wall of the stairwell and is also visible from the foyer. Stairwell. The custom-crafted stairwell runs from the lower level to the third-floor tower. Standing 34’ tall, the stairwell contains four fluted steel columns for support. 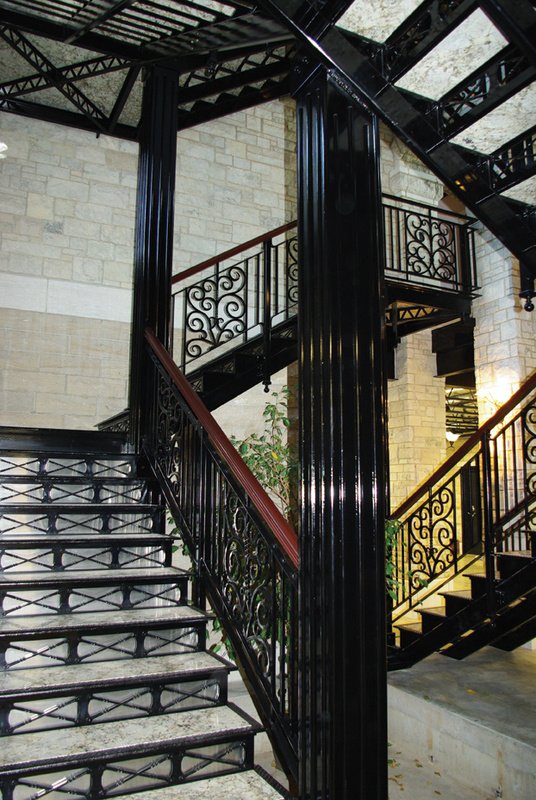 The eight stair runs, which include the risers and railings, are made from 100 percent recycled ornamental iron custom designed by Eureka Forge. Granite stair treads and landings are polished on the top and bottom and are 1 ¼” thick.